Depending upon the situation, fault for motorcycle accidents may rest with the motorcyclist, automobile driver, or motorcycle manufacturer. Motorcycles are much smaller and lighter than cars, have only two wheels, and do not shield the rider with protective metal. These characteristics make motorcycle riding riskier, and compared with car accidents, motorcycle accidents are more likely to result in death or serious injury. Motorcyclists traveling on the scenic roads of Colorado are more prone to make sharp turns and get distracted by surrounding landscapes. In 2013, more than 66 percent of all Colorado motorcycle accidents were the fault of the motorcyclists themselves, and 40 percent of fatal motorcycle crashes involved only the motorcycle and no other vehicle. When a motorcyclist speeds or drives under the influence of alcohol or drugs, he will likely be considered at fault for any accident that occurs. If a motorcyclist drives between two lanes of stopped or slowly moving vehicles, a practice known as lane splitting, fault for an accident will depend upon whether lane splitting is permissible in the particular state where the accident occurred, but there’s a reasonable chance that fault will be attributed to the motorcyclist. Lane splitting is against the law in Colorado. If the motorcyclist is able to establish that the driver of the other vehicle involved was rapidly changing lanes, weaving, or was distracted by a cell phone, that driver may be held at least partially at fault. 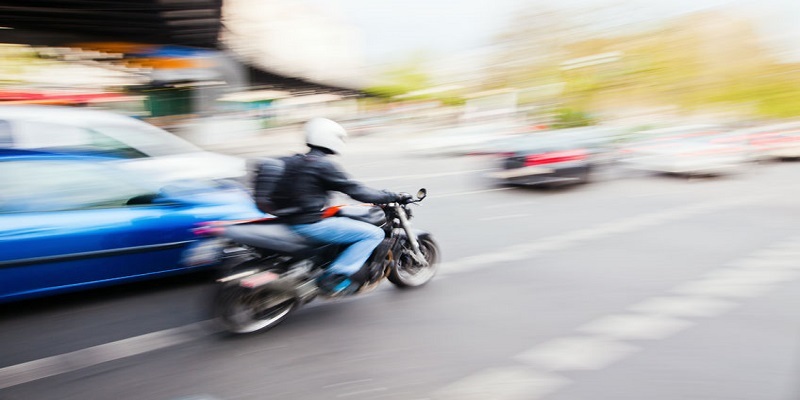 Motorcycle accidents often occur when the driver of an automobile violates a traffic law, such as speeding, running a stop light, or failing to yield, and hits or is hit by a motorcyclist. Motorcyclists are often difficult for other motorists to see, especially at intersections where traffic may be heavy or vehicles are attempting to merge onto a highway. However, failure to see a motorcycle doesn’t relieve a driver of his responsibility when it comes to a crash if he fails to check his blind spots, misjudges the speed and position of a motorcycle, or follows a motorcycle too closely. If a car hits a motorcycle while turning left, the driver of the car will typically be found at fault for the accident, unless the motorcyclist was speeding, in the wrong lane, or in the process of committing some other traffic violation. Distracted driving, such as eating, talking to other passengers, or even daydreaming while driving, can take a motorist’s attention away from the road and put other drivers, particularly motorcyclists, at risk. Experts estimate that more than 50 percent of all motorcycle accidents are caused by a driver who violates a motorcyclist’s right of way. Drivers who are preoccupied on their cell phones also put motorcyclists in jeopardy and cause deadly accidents. Under Colorado law, it’s illegal for drivers of all ages to text while driving, although drivers 18 years old and older are allowed to use cell phones to make calls during certain specific situations, such as to report an accident, criminal activity, or reckless driving. If a motorcycle accident is caused by a malfunction of the motorcycle due to a defective design, manufacture, or assembly, the motorcycle manufacturer may be liable. In situations where a motorcycle or its parts have been recalled, retailers have a responsibility to pull parts from their shelves or to stop selling the motorcycle. If this wasn’t done and no measures were taken to correct or fix the problem, the motorcycle retailer could also be held liable. If a failure in safety gear, such as a helmet or goggles, caused or made a motorcyclist’s injuries worse, then the maker and seller of the defective item might also be held liable. When motorcycle accidents are caused by the willful or negligent conduct of another party, a personal injury lawsuit can be filed to obtain damages from those responsible. If you were seriously injured in a motorcycle accident, the fastest way to find out if you have a case is to schedule a free consultation with me. At the Law Offices of Daniel R. Rosen, our goal is to get you through your accident and injury claim as quickly and smoothly as we can. I’ve earned over $100 million in settlements for my clients and personally handle every single case that comes across my desk. I can get you the settlement you deserve, and you won’t pay a penny until I come through for you. Fill out this form to tell me about your accident and schedule a free consultation.